Located a beautiful 20-minute drive north of Whistler and a scenic 158km from Vancouver, Pemberton is your gateway to adventure, nature, and fun! Pemberton’s terrain lends itself as the perfect host for a number of outdoor activities and events. Immediate access to out-of-the-ordinary BC wilderness makes it the place to be for outdoor sportspeople and adventurers alike. However, parts of that wilderness have been made accessible so that visitors of all ages and abilities can experience all that Pemberton has to offer. From weekly and annually recurring events to outdoor activities, you’ll never be bored in Pemberton! Description: The Pemberton Farmers’ Market brings together local producers and consumers, creating a marketplace for the freshest high quality produce in Pemberton. 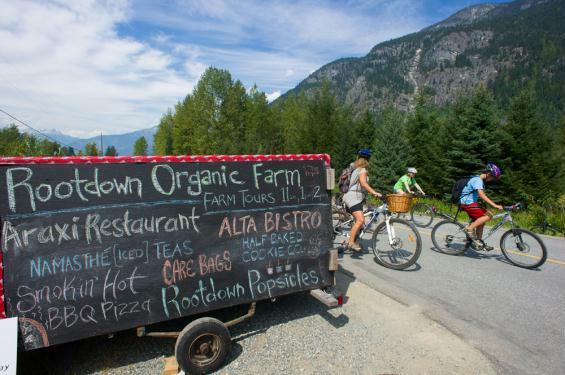 The Market fosters a healthy and sustainable organic farming industry in the Pemberton area while also striving to bring the diverse community together every week of the season. Description: Check out the work of a number of young artists tasked with creating art related to the history of the Pemberton Valley in the last 150 years, from the perspective of Mount Currie. The resulting lanterns the children created will be displayed at the Pemberton Museum, and will accompany their creators during the Canada Day parade. Description: It’s a bird! It’s a plane! It’s… Canadian paragliders! Look up and behold a myriad of pilots as they take to the sky in this National ‘A’ competition. Description: Watch Canada’s fittest compete in Ironman, the ultimate test of endurance, strength, and heart. Cheer on your favourite competitors while enjoying the sun and feeling thankful that you’re not competing! Description: Hit up the Slow Food Cycle for a celebration of food, farmers, and the joys of biking. The 13th annual event, presented by Pemberton Valley Supermarket, is a 45 km ride up and down Pemberton Meadows Road. Choose your own pace and do as much or as little of the route as you like, while visiting Pemberton farms and vendors. Purchase local produce, crafts, and much more along the way.